Note: I took a lot of notes for this post, but never actually wrote it up. Here, for posterity’s sake, is my final installment. Saturday, December 18, I awoke early in my sumptous suite at the Doubletree in Chicago, excited to get going. I was heading home! Although the train wasn’t leaving until 2:20 that afternoon, I dressed, had breakfast, and then promptly checked out. 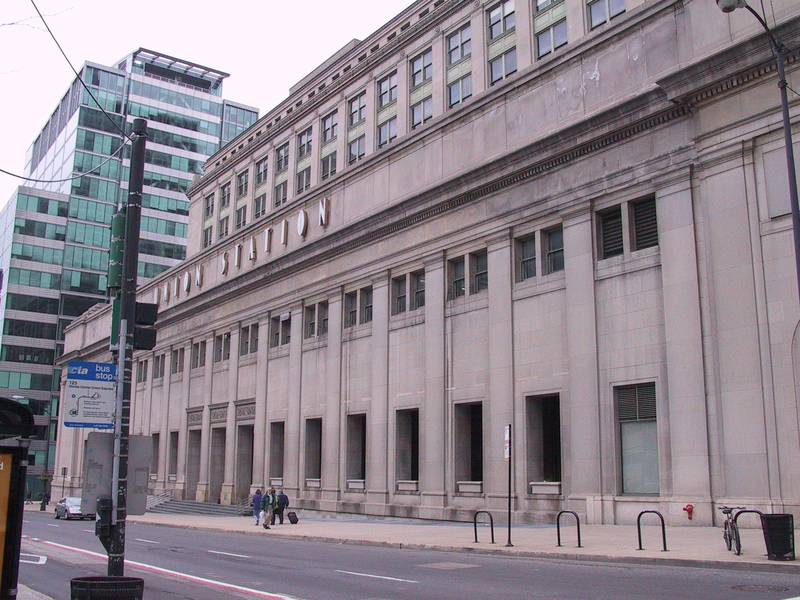 A short taxi ride later, I was standing in front Chicago’s Union Station, bags in hand. I was quite early—it was only about 10:00 or so in the morning—but I was eager to get home, and didn’t mind the wait. Plus, I figured I could explore the station, which would kill some time. But my taxi had dropped me off here, and the few signs I saw indicated that I might be in the right place. 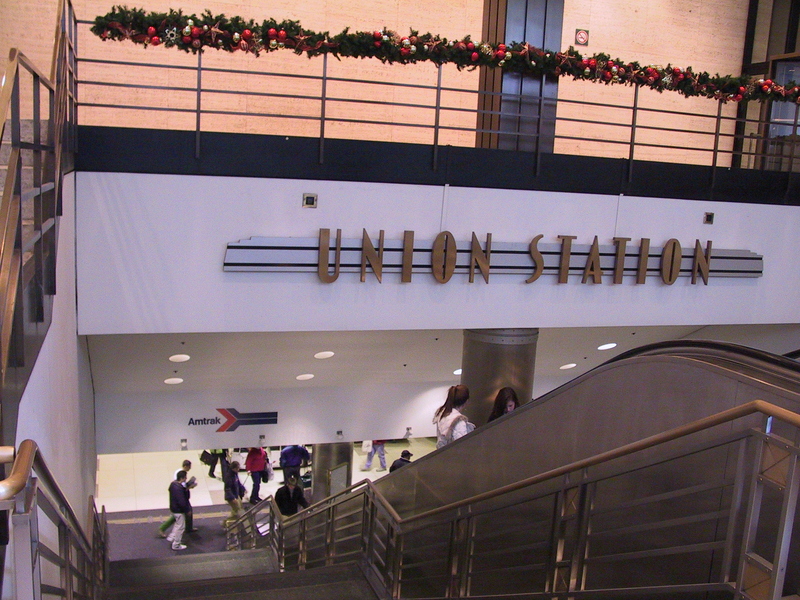 Upon entering the doors I was immediately faced with escalators and stairs that took me down to the station. “Down” explains why the entrance is so nondescript, and why it looks like you are simply entering an office building. What you see from the outside is an office building. The entire station—trains and all—is below ground level. But it turns out that the station sits right against the Chicago River, so if you walk across one of the many bridges to the other side and then look back, you’ll see some of the tracks and the trains since (presumably to help keep the air down there free of diesel fumes) the side of the train station between ground level and the river’s water level is open to the outside world. As in New York, putting the trains below ground level not only allows the trains to come and go without interfering with the cars and pedestrians above, but also allows passengers to board the trains in relative comfort, regardless of the weather outside. The extent to which the trains are underground in Chicago is quite impressive: when departing, the train travels for quite some time before actually emerging out into the open air. By now I was well up on looking for the “first class” lounge for sleeper passengers. The Metropolitan Lounge in the Chicago station is a particularly nice one, with free coffee and sodas, comfortable chairs, free Wi-Fi, TVs, and an attended baggage room where you can dump your bags if you are there for a while and want to explore the station—or beyond—unencumbered, as I did. After passing through lounge’s the rather understated automatic doors I found myself facing a check-in counter. I presented my ticket, and the attendant registered my presence and informed me that when it was time to go they would announce the train and then walk us out to it. I was then directed to the baggage room, where I was able to hand off my suitcase and overcoat until it was time for the train to leave. With nearly four hours until my train was to depart, I proceeded to explore the station. I first went to learn what the Amtrak experience is like for coach passengers. I was pleased to see that the waiting areas are very nice: very much on par with what you find in a modern airport, with reasonably comfortable seating and a nearby counter where you can check in and get information. 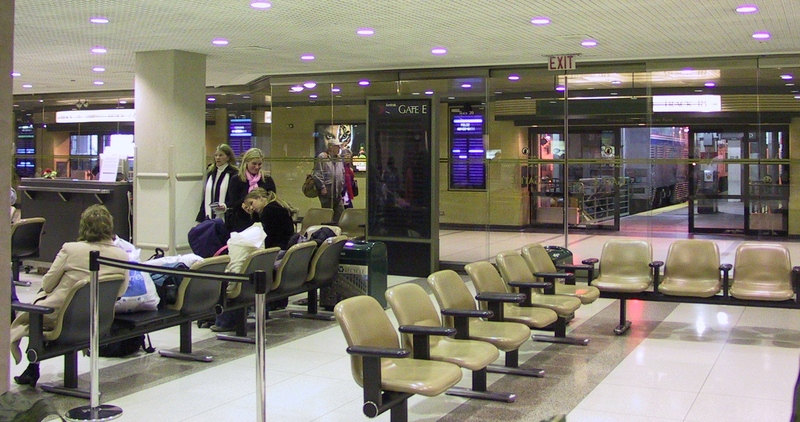 As at an airport, the station is organized into a series of “gates”, one per track, with excellent signage indicating where and when each train is going. 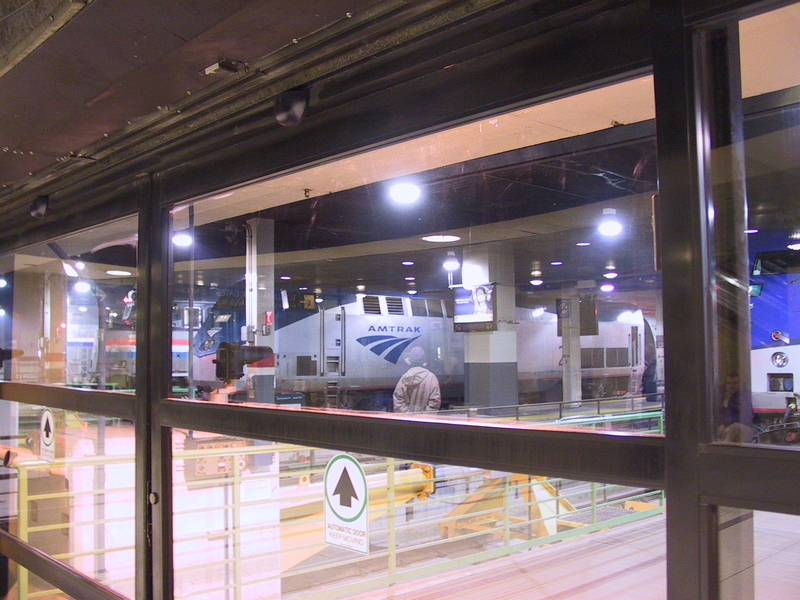 Through the glass walls and doors you can easily see your train. When boarding begins, the glass doors to the track open, and you simply walk alongside the train to your assigned car. I was awestruck. This is what I had expected the train station to look like. Polished marble floors, high ceilings, beautiful plasterwork, and long pew-like wooden seats. Wondering where I was (and when! Had I traveled in time? ), I explored the room, thinking that perhaps some trains went out of the other, more modern station, and some from here. But I was quickly disabused of that notion; my explorations ultimately revealed that this—what was once the old Union Station—is now no more than a glorified waiting room. As I made my exploration of the old station, I found a set of well-worn marble steps that led up to a set of exterior doors. Because I wanted to figure out just where I was, I exited through the doors and looked around. Peering up at the building from which I had just emerged, I saw letters that spelled out “Union Station”. Directly across the street was the backside of the newer station; a backside that looked even less like a train station than the front entrance had. Having confirmed my suspicion that I was in the old station, I re-entered it and made my way back through the tunnel—which takes you beneath the street in the above picture—to the new one. I then returned to the Metropolitan Lounge, retrieved my bag and coat (the baggage room is only for storage; you still have to retrieve your bags and carry them out to the train yourself), and settled in to surf the Internet and just generally while away the remaining hours until my train was ready to depart. Forty minutes or so before the train was due to depart we were instructed to gather at a closed door that I had not previously noticed. An Amtrak employee then opened the door and escorted us out along a walkway that circumnavigated the lounge and ultimately led to our train’s platform. I kept near the front of the pack, as is my nature, and was the first to board my particular sleeping car. Tony, our car steward, greeted me at the entrance to the car and directed me to my compartment. Still carrying my bag and coat—traveling alone, I had plenty of room in my roomette for my bag, so I didn’t need to deposit it on the downstairs luggage rack as I often do—I headed upstairs and settled in to my assigned compartment. Because the California Zephyr—the train I was on—originates in Chicago, it had been sitting there for some time and had been serviced much earlier. Consequently Amtrak allows the sleeping car passengers to board quite early (forty minutes or so, in our case) allowing them to then focus on getting the coach passengers to their assigned seats. I therefore had quite some time to settle in to my roomette before we got underway, which we did right at the appointed time. 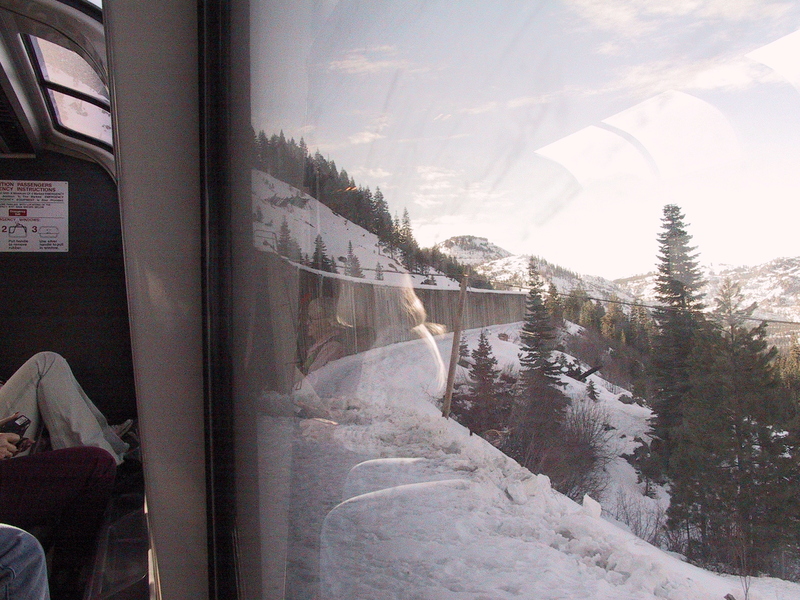 That trip, which was my first on the California Zephyr, made it one of my favorite trains. In a nutshell, you get on in Chicago at around 2:00 in the afternoon. You have dinner while cruising through Iowa, and are in bed by Nebraska. The next morning you wake up in Denver. You then climb over the Rockies and follow the Colorado River from its origin to the base of the mountains on the west side. Dinner finds you in Utah, and you are in bed before pulling in to Salt Lake City. The next morning you awaken just before arriving in Reno, and you get to enjoy breakfast while ascending the Sierras on the eastern side. Then you make your way down the western Sierras and by around 2:00 you are in Sacramento. By 4:00 pm you are at the end of the line in Emeryville (where you can connect via bus to San Francisco). In short, you see all the interesting stuff throughout your day (the Rockies, the Sierras) and sleep through all the flat, boring bits (such as eastern Nevada). And the reverse journey works just as well, in case you are considering riding it east to Chicago. End-to-end, the Zephyr normally takes about 50 hours. In my case the train lost time due first to a medical emergency—we had to stop and meet an ambulance, who evacuated a passenger from one of the coach cars—and then, because we were off schedule, we lost additional time from having to hold at various points for freight trains, who had the right-of-way. All told, we lost an hour and a half on that trip, which wasn’t terribly bad considering the overall length of the journey. On this trip most of our delays occurred prior to Denver, so that rather than arriving at around 7:30 am we instead got there closer to 8:30. By then I had already had breakfast, so I elected to spend our time in Denver (it is a “service stop” where they service the train; the train stops there for more than 45 minutes) off the train. I ran into the station and out the front door, giving me a good look at the front of the station and the surrounding environs. I was a bit surprised to realize that Coors Field—where the Colorado Rockies play baseball—is right next to the station. 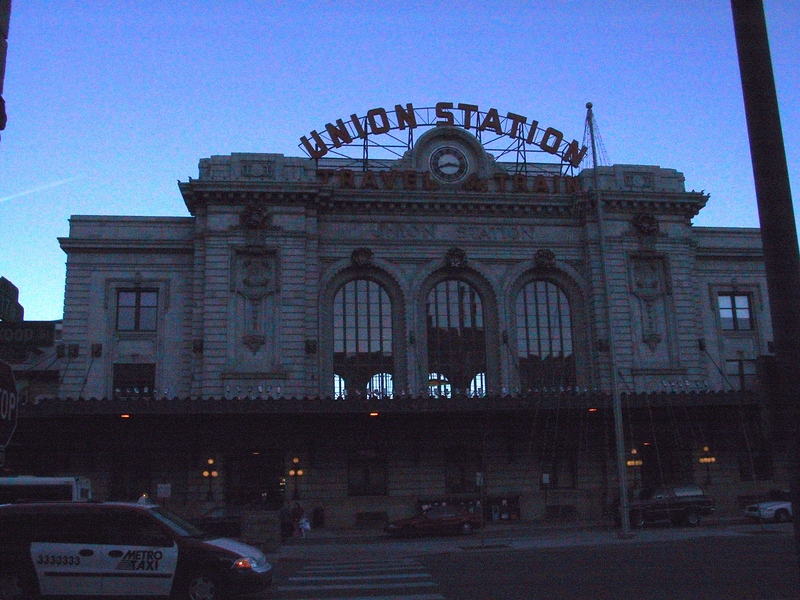 The station itself is a beautiful old imposing building, with high arched windows, a large clock over the front, and a large sign framing the clock that proclaimed “Union Station” and “Travel by Train”. Mindful of my limited time I returned to the station and checked out the gift shop. I was delighted to find a set of three spiral-bound books titled “A Guidebook to Amtrak’s California Zephyr”; they are a milepost-by-milepost description of the entire route from Chicago to San Francisco. I bought them, naturally, and throughout the rest of the journey I would consult them whenever I wanted to know more about what I was seeing outside my compartment window. The trip over the Rockies from Denver was spectacular. The train does a long, slow climb up the eastern side, navigating a series of switchbacks that present you with tremendous views of the city below. When we approached the very top, I got to see one of the wonders of the Amtrak system: the Moffat Tunnel. This is a 6.2 mile-long tunnel that pierces the very tip of the Rockies. It actually has a giant curtain on the eastern side; once the train has passed into the tunnel the curtain closes and huge blowers turn on to push the train’s exhaust out the western end of the tunnel. The conductor came on the intercom system and warned everyone to stay put for the entire 15-minute traversal of the tunnel; they don’t want you opening the doors between the train cars, which would let in some of the exhaust still lingering within the tunnel. 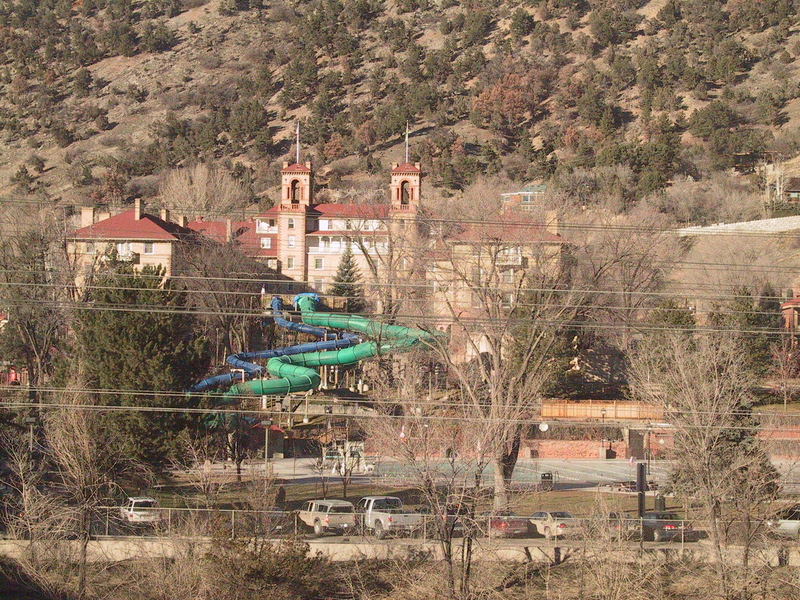 About an hour after going through the Moffat Tunnel we pulled in to the little town of Glenwood Springs. This being a “smoke stop” (one long enough for smokers to descend from the train and have a desperately needed cigarette), I was able to get off the train and study the rather incongruous sight that lay across the river from me: a huge, classic old hotel from which a pair of blue and green tubes seemed to emerge and make their way in zig-zag fashion to a steaming swimming pool. It turns out that there is a natural hot spring here, and back in 1888 it was developed into a modern bathing pool—the largest in the world, apparently. In 1893 the Hotel Colorado, which is the building I could see behind the pool, was built. And sometime not too long ago, I’m guessing, the blue and green tubes—which in fact are fully-enclosed water slides—were built. 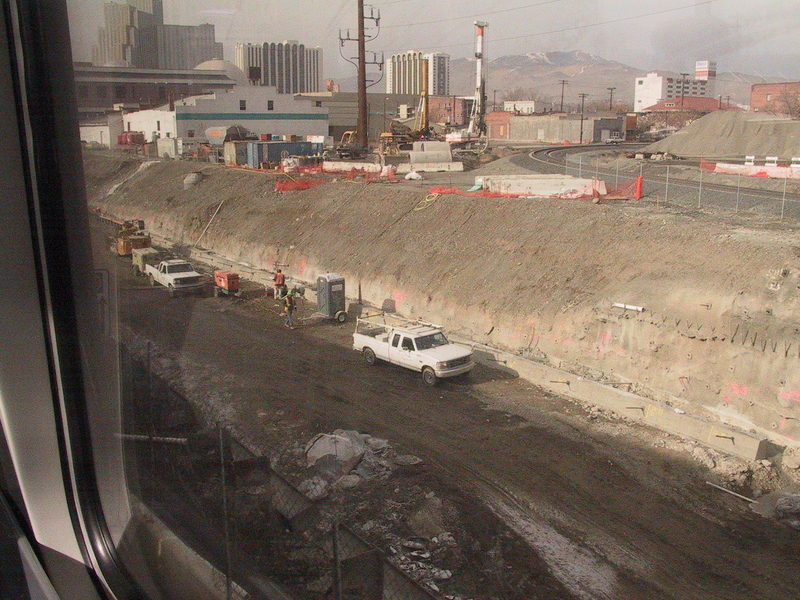 The next morning, as we pulled into Reno, I was interested to see that Amtrak was digging a huge ditch immediately adjacent to, and parallel to, the tracks. I then noted that the track we were on ran right down the middle of a busy street, and that whenever the train came through all traffic simply had to stop. In this day and age this isn’t acceptable, however, so soon the tracks will be rerouted; no longer will the Zephyr run down the middle of the street in Reno. From Truckee to Emeryville (my final stop!) takes about six and a half hours; there are several stops in between (in particular, Sacramento, which is a somewhat longer stop). By this point, however, with three weeks of traveling behind me, with six-plus hours of traveling through very familiar territory still to go, and knowing that my wife was eagerly waiting for me in Emeryville, I almost couldn’t stand it. I just wanted to be home! The fact that we were an hour and a half behind schedule didn’t help, either. But of course we got there in the end. I had never been so eager to get off a train before! My wife was right alongside the train to greet me, and after a long, loving embrace she made it clear that I’d never be doing something like this by myself again (but she was more than willing to go along on any future trips!). I didn’t really have any objections to that, since I felt the same way. Doing this alone was an interesting experiment, but I’m a happily married man for a reason: I actually like spending time with my wife and family and really miss them when I am not with them. Since I couldn’t afford to quit my job, the natural course would have been for me to start down one of these new paths on the side—in my spare time. But what little spare time I had, I wanted to spend with my family. My kids were growing, and soon they’d be off to college. I didn’t want to spend the precious few years I had with them instead sitting alone, trying to write the Great American Novel. Thus, I decided to stay the course for the time being, continuing down the career track that I was currently on until such time as my kids were through with college. I also resolved to focus on my personal finances, saving money and reducing expenses wherever I reasonably could. Hopefully by the time my kids were out of college and on their own I’d then be able to quit my job and freely explore new directions. I was deferring my dreams, but it was only for a relatively short while. My trip may not have provided any earth-shattering insights, but it did what a sabbatical is supposed to do: it affirmed my current direction and gave me a plan for my future. In my case, a plan that would, at some point in the not-too-distant future, allow me to follow my heart, rather than just my head. Planning takes time, and it takes thought. Life moves at such a rapid pace these days that we rarely get those quiet intervals we need to really think about what’s going on around us. My trip on Amtrak gave me a number of such intervals. Although some people reject the train out of hand due to the amount of time it takes to get somewhere, my experience makes me feel the opposite: Amtrak is not only a great way to see the country and meet other people, it also gives you that rare gift: time to relax and think. Give Amtrak a try, and keep an open mind. You’ll be glad you did. This entry was posted in Uncategorized on June 11, 2014 by Greg Wilson.